Space debris is the discarded remnants of humanity's endeavours in space, consisting of fragments from space launches, collisions between operational hardware (satellites) and material degradation. Since 1957, more than 4700 space-launches have propelled payloads of various sizes into Earth's orbit. Every launch increases the number of inert objects in orbit (a payload represents on average only one to 10 per cent of the total load in orbit). At present there are about 35 million objects of more than 0.1 cm in orbit; importantly, only 13,420 objects of more than 10 cm are catalogued, and the debris is increasing at a rate of 220 objects per year. 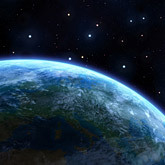 Although some objects in low Earth orbits eventually re-enter the Earth’s atmosphere, the majority stay in the Earth’s orbit for centuries. This debris thus poses a threat to future space endeavours and all nations that rely on satellite technology for communication, security and daily operations. Protecting our assets from counter-space capabilities and from accidental damage caused by space debris will be critical. We rely on the United States for much of our space advantage, but we should also seek ways to develop our nascent but growing expertise in space capabilities. Since 2004 UWA researchers have been collaborating with French Astronomers and CNES (The French Space Agency) to observe and study satellites and debris in geostationary orbits. The French use a network of rapid response robotic telescopes called TAROT (Rapid Action Telescope for Transient Objects) [Klotz 09b, Laas-Bourez 08b]. One is located in OCA observatory, France (GPS 6.92353 E 43.75203 1320.0) and the second is in ESO (European Space Organisation) La Silla, Chile (GPS 70.7326 W -29.259917 2398). This research has led French astronomers to develop new techniques that allow them to track space debris down to centimetre-scale lengths. In 2010, UWA (in partnership with the French) will launch a pilot program designed to track space debris over Australasia. The three robotic telescopes: TAROT (France and Chile) and Zadko (Australia) will be linked by high-speed communications to allow optimal sky coverage and timing measurements for determining LEO space debris orbits. The pilot program has received the support of the Federal Minister for Industry, Innovation, Science and Research in the form of funding for a research exchange program between UWA and France.